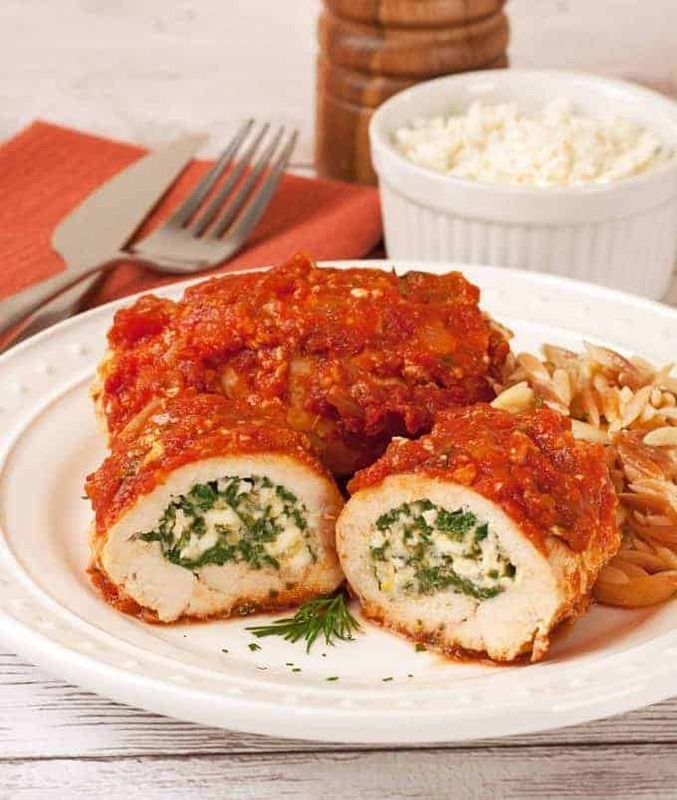 Baked in a simple tomato sauce and filled with a tasty mixture of fresh spinach, dill and feta cheese, these boneless, stuffed chicken breasts turn out moist and tender every time. 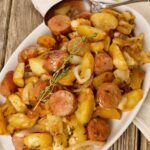 And, because it’s an easy dish to prepare in advance, it makes a great choice to serve for company. 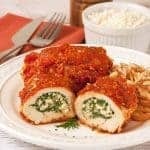 These chicken breasts are filled with a mixture of fresh spinach, dill and feta cheese and baked in tomato sauce until tender and juicy. 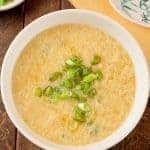 Great served with either pasta or steamed rice. Preheat the oven to 375°F. Coat a 13 x 9-inch baking dish with nonstick spray. One at a time, place the chicken breasts between two sheets of plastic wrap and gently pound them to a thickness of no more than 1/4-inch. Cut each one in half to make 8 pieces total and refrigerate until ready to use. Heat the olive oil in a large skillet over medium-high heat. Add the spinach, a handful at a time, cooking each addition until wilted before adding more. Transfer to a strainer and press out as much liquid as possible. Set aside to cool completely. Combine the feta cheese, eggs, breadcrumbs, scallions, dill, oregano and a few grinds of black pepper in a mixing bowl. 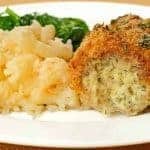 Mix in the cooled spinach and refrigerate until ready to use. Prepare the sauce in the same pan used to cook the spinach. Add the olive oil and heat over medium heat. Add the onion and cook until soft and translucent, 4 to 5 minutes. Add the garlic and cook until fragrant, 1 to 2 minutes more. Stir in the tomatoes, oregano and dill and season to taste with salt and pepper. Reduce the heat to medium-low, cover and cook for 10 minutes, stirring occasionally. Spread about 1/3 of the sauce in the bottom of the prepared baking dish and set aside. 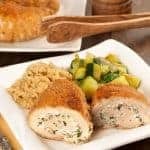 Lay a piece of chicken on a flat surface and spoon 1-1/2 to 2 tablespoons of the filling mixture about 3/4-inch in from the short end. Carefully roll the chicken around the filling and place the roll, seam side down in the baking dish. Repeat with the remaining chicken, then spoon the rest of the sauce over the rolls. 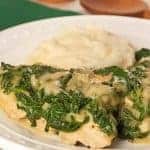 Cover the pan with foil and bake for 35 to 45 minutes or until the chicken is cooked through and the filling reaches an internal temperature of 155°F. 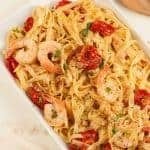 Serve with a side dish of orzo or rice and a green vegetable or salad. 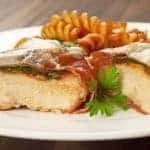 This dish can be prepared in advance, refrigerated and baked just before serving. Follow the instructions above, but be certain that your sauce has cooled completely before rolling the chicken and assembling the casserole. Cover tightly and refrigerate for up to 8 hours. Remove the dish from the refrigerator for 45 minutes prior to baking.